These young high-achievers are gracing the 2019 edition of Forbes Middle East 30 Under 30. It doesn't take two people to tell you that the Middle East is buzzing with young talent and entrepreneurship that are promising to transform the diverse region into an economic hub for the future. Lebanese youth are advancing in all the fields; science, business, sports, arts, and culture to name a few. 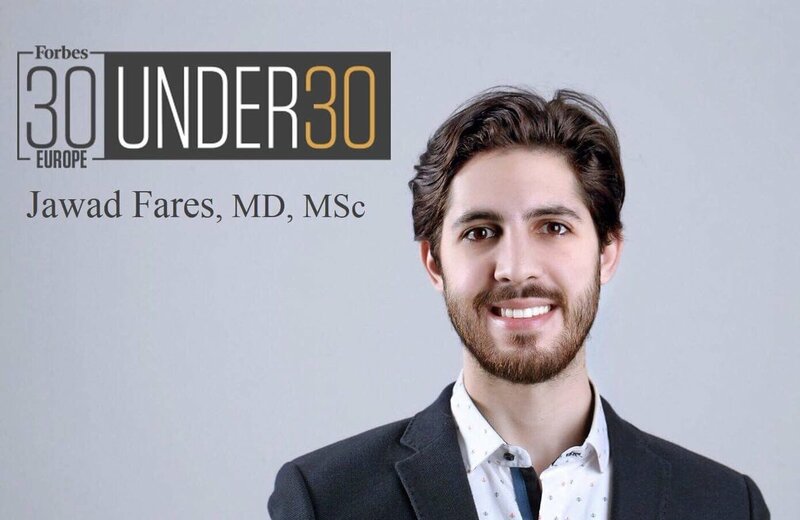 Forbes Middle East just released its latest '30 Under 30' list, and Lebanon has taken its fair share of the cut. Twenty-nine-year-old Ralph Masri is an award-winning jeweler who made a name for himself in the Middle East as well as in Europe. At the mere age of 18, Raph moved from Beirut to London to train as a jeweler at Central Saint Martins. His first major milestone occurred when he won the Swarovski Award as a first-year student, which gave him the opportunity to work for the global brand. After setting up his eponymous brand, Ralph opened his first showroom in the heart of Beirut in 2014, and two years later he was named an honorary Fine Jewelry Winner at the 2016 DDFC/Vogue Fashion Prize, cementing his status as one of the Middle East’s top emerging talents. His style mixes the finesse of fine jewelry with the bold spirit of fashion artistry, creating statement pieces the likes of Katy Perry and Queen Rania enjoy! Lebanese national Marwan Aboudib, who is based in Massachusetts, US, has whipped up a solid reputation in designing smart cities across the world. He started Tekuma Inc. that brings large-scale art installations into the urban public realm. Recently, Abou Dib, now 28, was instrumental in launching another firm, Tekuma |Frenchman Urban Design LLC, which is creating cities and urban districts in China, Korea, and Saudi Arabia. Jawad Yousef Fares is a 27-year-old doctor, researcher, and scientist. He was featured TWICE on the Forbes 30 Under 30 list in science and healthcare for his contribution to solving healthcare problems in the developing world and was selected as one of the top 10 young scientists in the world by Genetic Engineering and Biotechnology News. Born in Spain to neurosurgeon Youssef Fares and architect-psychologist Aida Hoteit, both Lebanese, Jawad was then raised in Beirut. He credits his thirst for knowledge and medical discovery to his upbringing. Fares earned a B.S. degree in Biology from the American University of Beirut (AUB) where he also attended medical school to acquire his M.D. degree. He, concurrently, attained an M.S. degree in Neuropsychology from the Lebanese University Neuroscience Research Center. Audrey Nakad is a 27-year-old Lebanese entrepreneur who started an ever-growing company at the mere age of 25. Synkers is an online peer-to-peer education platform that connects private tutors with students. The company began in 2016 when Audrey’s sister told her she needed a tutor without realizing that Audrey herself was a private tutor! The company now works with 50 institutions across Lebanon and Dubai with 1000 tutors on its platform. Nakad claims that the students using Synkers have seen a 20-30% improvement in academic achievement, and the company is now looking to expand its reach across the Middle East and North Africa (Mena) region. Twenty-seven-year-old Charlie El Khoury is the co-founder and CEO of NAR – Next Automated Robot – whose mission was to transform drones from flying cameras to flying computers. NAR developed this application, later on, to become one that can observe oil and gas pipelines for spillages and infringements. NAR was chosen among the best companies that are in the same batch in speed’s accelerator program and that were sent to Silicon Valley to join the post-quickening program BlackBox connect. Stefano Fallaha, 20, is the Founder & CEO of Fallound, an app and software that connects to car navigation systems to aggregate and summarize perfectly-timed audio podcasts based on a user’s commute time and interests. He was on the list of the Top Executive Entrepreneurs in Lebanon at only 16 years old. He has since been awarded Outstanding Entrepreneur Award. Stefano also graced the cover of Arabian Business Magazine and is currently ranked as one of the Top Student Entrepreneurs in the world. Fallound has now partnered with FIFA WorldCup 2022 to stream their audio sport news to over 100 million users. It has also teamed up with one of the largest mobile operators in Africa to spread knowledge to over 6 million African people via educational podcasts.